AUSTIN — Her hair pulled back into a ponytail, donning a burgundy blouse with flower petals and a wide smile that illuminates her olive-skinned, naturally-glowing face, Maria Duque Ortega enthusiastically asks a waitress about the Salvadoran drinks on the lunch menu. Sometimes the names of drinks differ from that of her native Mexico, so she wants to make sure she’s placing the correct order. Something sweet to drink sounds like the perfect way to begin yet another record hot summer day in Austin, Texas. It’s Ortega’s only day off in an otherwise long work week. Earlier in the week at work, she suffered a heat stroke scare at the dry-cleaning business where she irons clothes all day long in a room where the air conditioning unit seems to do little more than move warm air around. As she talks, she recalls how alarmed she became when she noticed she had stopped sweating. Her coworker pointed out her lips had turned a pale white. Her mouth felt cold. Within moments, she collapsed, burning her arm on the iron as she fell. She says her supervisor sent her home after the incident, but Ortega returned the following day. Like many low-wage workers, if she doesn’t show up, she doesn’t get paid. At age 41, she says dreaming about the day she can put the iron down on the ironing board for the last time seems like a luxury. “It wasn’t until four or five years ago that my husband and I became really concerned that we don’t have a plan for retirement,” she says. “He’s turning 50 in two weeks. When you’re busy working and raising kids you don’t realize how fast and how much time passes. “Our circumstances hadn’t allowed us to plan for retirement but now we know we have to start thinking about it,” she adds. Most immigrants make so little that retirement savings are luxury many can’t afford. According to a study done by the pro-union Economic Policy Institute in 2016, 60% of Latinos have no retirement savings at all and 72% of Latinos say that they haven’t begun planning for retirement at all. Even worse, undocumented immigrants are barred from enjoying Social Security or Medicare-like other elderly workers. Activists say that many documented immigrants often don’t realize that their work visas make them eligible for Social Security benefits if they have worked for more than ten years in the United States. 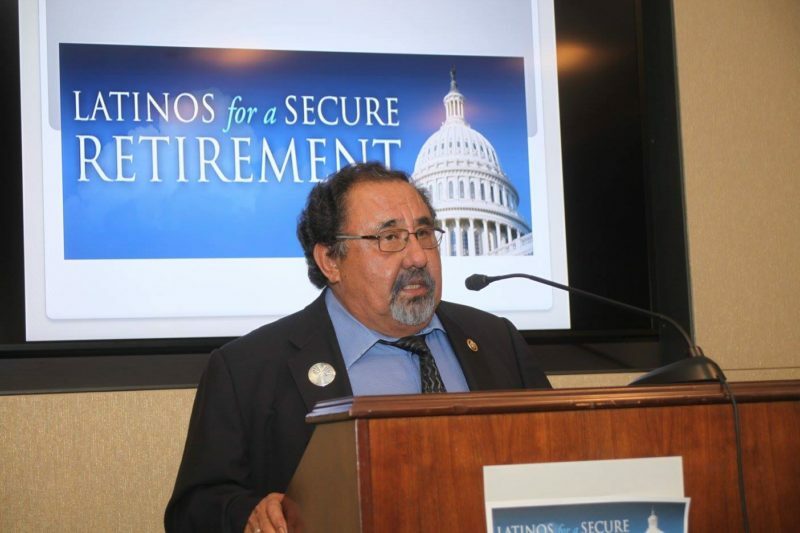 However, now, a new coalition of senior citizens and Latinos under the banner of Latinos for Secure Retirements are forming to fight for Social Security benefits and access to retirement saving plans. Not only would allowing immigrants into the Social Security system help reduce elderly poverty among Latinos, but it would also create a new stream of revenue that could help expand Social Security benefits for all Americans. “If you really wanna make sure that Americans are being taken care of at the end of their lifetime, it’s really incumbent that we pass immigrant reform,” says Abigail Zapote, Executive Director of Latinos for a Secure Retirement. With the American population aging and the US Census predicting by 2030 that the number of those over 65 will nearly double, the growing Latino population, whose median age is 28, could help provide a necessary source of revenue to keep the Social Security system solvent. Undocumented immigrants using fake social security numbers to find employment already pay $13 billion a year into the Social Security Trust Fund, but reap no benefits as their Social Security numbers are fake. With immigration reform, not only would it lift many elderly Latinos and the families, who support them, out of poverty, but it would also dramatically improve the fiscal health of the Social Security Trust Fund. According to a study done by the Office of Chief Actuary of the Social Security Administration in 2017, if Trump’s policy to cut in half the number of immigrants allowed into the country went into effect, the Social Security Trust Fund would lose $2.4 trillion over the next 75 years. Whereas if the US were simply to double the number of legal immigrants, it would lead to the Social Security Trust Fund containing $5 trillion more a year. “It would be such, such a benefit to the American people and the people of the United States to create a process to become citizens or have legal residence because that would be another 11 million people into the labor force and money into these programs like Social Security,” says Zapote. 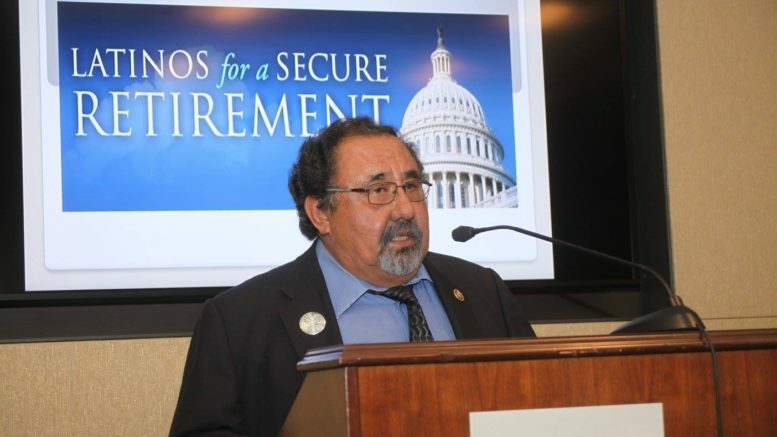 To help organize around this issue, Latinos for Secure Retirement is doing a “Cafecito” summer tour around the country holding town halls focusing on the need to expand Social Security to immigrants. In addition to political advocacy, the group is also hoping to galvanize a deeper conversation within the Latino community about the need for more intensive educational efforts on how immigrants can plan for retirement even without Social Security. “If we don’t understand how different tools to retire securely work that is really going to impact that family’s income,” says Maria Madrid, an expert in Latino retirement security at the Colorado Gerontological Society. “It’s not only the senior that is retiring, but also their caregivers”. “There are many instances where caregivers are forgoing their own careers and their own ability to be income earners in their family to be able to stay home and take care of their elderly,” says Madrid. “This becomes a cycle of barriers not just for the older adults now, but also how future generations are able to retire and retire securely”. When Ortega immigrated to the United States, saving for her retirement was the last thing on her mind. The year was 1994 and Mexico’s people were suffering from severe unemployment resulting from the currency crisis. The Mexican peso saw a sudden and severe devaluation against the American dollar. After completing her secretarial education in Mexico, she relentlessly looked for a job in San Luis Potosí, but even after expanding her work to other states within Mexico, she was still unable to find work. Ortega, like so many other hard-working people, were collateral damage of the destabilization of Mexico’s economy caused by the devaluation of the peso as NAFTA took effect. At the age of only 22 years old, Ortega made the painful decision to leave all she had ever known behind, to begin a new life with her husband, Felipe Ortega, and young son, Luis Ortega, in the United States. Luis was only 4 years old at the time. Now, he is 24 years old and a Deferred Action for Childhood Arrivals (DACA) recipient. “It was a drastic change at the beginning,” Ortega says, as she places her crispy tortilla chip back on her bright red plate. She looks off to her left and a melancholy aura surrounds her as she pauses and reflects. She composes herself after staring off for a few moments. “Sometimes, I think I still can’t get used it. Without knowing English everything is more difficult,” Ortega shares. “I’ve gone to school to learn English and I can’t get past the first level which is considered the basic level”. With her options limited, Ortega’s aunt eventually helped her find work in the dry cleaning business. She worked at a number of dry cleaning business throughout the Austin area before finally working at a dry cleaning business that regularly withheld the paychecks of migrant workers. Seeking to get paid for two weeks worth of work, Ortega asked the Workers Defense Project, an immigrant rights group in Austin, for help. The group helped her get her stolen wages back after Ortega recorded a threatening conversation with her employer which was successfully used as evidence in her case. Since winning her wage theft campaign, she has become increasingly active in the immigrant rights community within the last couple of years. Her son volunteers at the front desk at Immigrants United, an organization that helps immigrants to improve their lives through educational resources such as finance classes. The family is heavily involved with the immigrant community through their church, Immigrants United, and Jolt Texas, a new political mobilization organization for Latinos. Through their involvement in Jolt Texas, they began to realize how little they had planned for their own retirement a few years ago. For Ortega, something clicked in her mind when she heard Cristina Tzintzun, co-founder of the Workers Defense Project and founder of Jolt, pointed out that many Latinos are willing to spend hundreds and even thousands of dollars on quinceañeras and weddings, but not for a dignified retirement. Since then, the Ortegas have begun to plan more their own retirement and began to help others. “Last summer, we helped immigrants understand finances and how the law applies to immigrants,” says Ortega. “We were never educated on these issues ourselves and so we want to make sure other families know their financial, health and legal rights”. Meeting other immigrants through these sessions has opened Ortega’s eyes to how many immigrants live paycheck to paycheck with little savings or money earmarked for health or retirement. The low wages that the Ortegas earn, make it difficult for them to save for retirement, but they say its start. If they are unable to make enough for retirement, they say they are considering returning to Mexico to live a slower-paced, ranch lifestyle once they hit retirement age. Their money, they have saved, would go farther in Mexico than in the US. Felipe is turning 50 this year and Ortega worries about his health and quality of life in his later years. She is still in her early 40s but realizes the importance of planning for the future. “Life is very tough for immigrant Latinos here. We get up to work. We don’t have time to exercise, eat a healthy meal or prepare one for our families. We work 14-hour days,” says Ortega. “I understand life is too hard and they have to work to pay their bills,” says Ortega, “but it’s also important to administer your time and money, so you can reach that American dream that you came here for”. Christine Bolaños is an award-winning freelance writer based in Austin, Texas. The 2016 International Women’s Media Foundation fellow reported on women’s development and rights in El Salvador. Since then, a significant amount of her work has focused on women’s rights and immigration reaching potentially about 6 million readers throughout the world. Mike Elk is the co-founder of Payday Report and also covers labor and immigration for the Guardian. A member of the Newspaper Guild, he was illegally fired for union organizing as Politico’s senior labor reporter in August of 2015 and used his $70,000 NLRB settlement to start Payday Report. He now resides in his hometown of Pittsburgh, Pa, fifteen minutes from the union household where he grew up. This work is supported in part by a grant from Social Security Works to cover retirement security issues. Payday has full editorial control over what content it publishes. Donate to Payday to help us do more coverage like this. Be the first to comment on "Latinos & Seniors Organize to Expand Social Security to Immigrants"